AWDII will further cultivate the singer’s unique voice and style while strengthening the individual’s confidence and skill in song/worship leading. With the addition of song arrangement and song creation exercises, there will be exciting opportunities for you to liberate your creativity springing from your heart of worship. THE SPIRIT OF YHWH tracks the establishment of Biblical Israel as a nation. Partner with YHWH’s Spirit and grasp the will of heaven for all mankind. Thematic Devotion: THE SPIRIT OF YHWH. Raise your voice in answer of your highest call for the establishment of a righteous and just kingdom in your life on earth. Tonal Development: Learn new exercises for vibrato development and enhancement of vocal finesse, resonance and color. Expression & Song Interpretation: Incorporate new contemporary expression techniques into your singing to build richer vocal expression. Flow in newfound confidence and sensitivity for independent song interpretation. Basic Song Arrangement & Song Creation: Unleash your creative expression with independent song arrangement exercises. Worship Leading & Song Flow: Work on the basics of song/worship leading. Learn appropriate song selection based on themes, settings, while building sensitivity and momentum through your singing and musical accompaniment. Harmony & Ad libs: More harmony drills & applications to seal in instinctive part-singing. Also acquire new freedom in expression with vocal improvisation. Those who have completed Advanced Worship Dynamics (discontinued module) or AWDI Module. 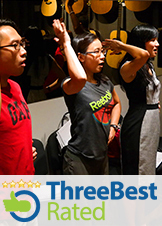 This module targets at developing your individuality in vocal delivery. The lessons will reinforce the works learnt and internalized from AWDI. At this level, much emphasis will be placed on enhancing your vocal timbre which is unique in every person. Upon greater discovery of your distinctive vocal sound, you will be trained to be more independent in applying it tastefully and creatively in songs. Basic song creation and worship leading skills will be imparted. Group work continues to be an integral part of the lessons in maintaining the dynamics of corporate singing and worship experience. - Greater awareness and knowledge on the resonance, texture of your voice and the art of crafting it into songs proficiently. - Experience in creating, arranging and singing your own song confidently. - Sharpened skills and sensitivity in worship leading and song flow. - Better synergy in corporate worship through harmony and spontaneous singing. - A well-anchored and more versatile voice.